Eight people have left President Trump's manufacturing council in recent days amid the extraordinary uproar sparked by the violence in Charlottesville. Others have opted to stay, even under pressure from grassroots groups. Some argue it's more valuable to have a seat at the table when the government is shaping policy that affects their companies. The names of the members below come from official White House lists published at the time each group was announced. 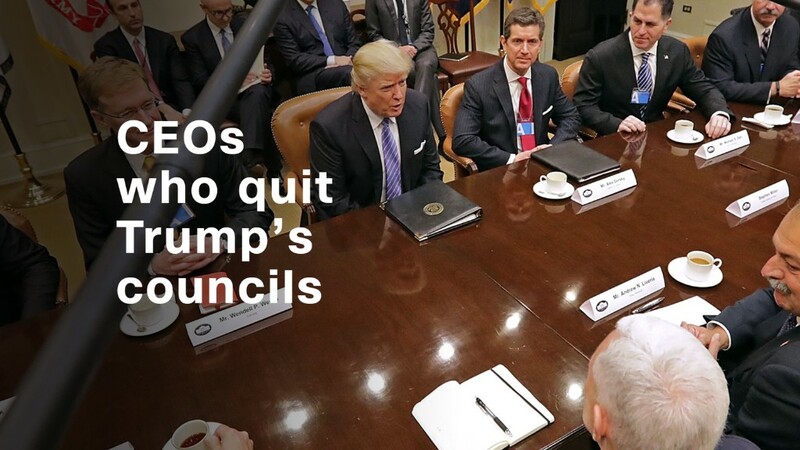 CNNMoney has reached out to all the members of the manufacturing panel, and a second presidential council on the economy, to ask where they stand. This list will be updated as developments require or new information comes in. Formed in January to advise Trump on job growth in manufacturing. Ken Frazier, Merck. Resigned after Trump's response to the violence in Charlottesville, Virginia. Brian Krzanich, Intel. Resigned after Charlottesville. Kevin Plank, Under Armour. Resigned after Charlottesville. Scott Paul, Alliance for American Manufacturing. Resigned after Charlottesville. Richard Trumka and Thea Lee, AFL-CIO. Resigned after Charlottesville. Inge Thulin, 3M. Resigned after Charlottesville. Denise Morrison, Campbell Soup. Resigned after Charlottesville. Elon Musk, SpaceX and Tesla. Resigned in June after Trump pulled U.S. out of Paris climate agreement. Mario Longhi, former CEO of U.S. Steel. Stepped down as CEO in May; company said it is no longer represented. Mark Fields, former CEO of Ford. Replaced as CEO in May; company said it is no longer represented. Marilynn Hewson, Lockheed Martin. Declined to comment. Bill Brown, Harris Corporation. Declined to comment. Alex Gorsky, Johnson & Johnson. This economic advisory group was created in December. Officials said Trump would call upon them to share experience and knowledge as he implements his economic agenda. Travis Kalanick, Uber. Dropped out in February after Trump's travel ban order. Musk, of SpaceX and Tesla. Resigned in June because of Trump's Paris climate decision. Bob Iger, Disney. Resigned in June because of the Paris decision. Adebayo "Bayo" Ogunlesi, Global Infrustructure Partners. Paul Atkins, Patomak Global Partners and a former commissioner of the Securities and Exchange Commission. Rich Lesser, Boston Consulting Group. Jim McNerney, the former CEO of Boeing. Daniel Yergin, a Pulitzer Prize winner and the vice chairman of IHS Markit. Wasn't available for comment Tuesday. Kevin Warsh, the Shepard Family Distinguished Visiting Fellow in Economics at the Hoover Institute at Stanford University and the former member of Board of Governors of the Federal Reserve. Stanford said Warsh wasn't available to comment. Jack Welch, GE's former chairman and CEO. Wasn't available for comment Tuesday.